Chest flies with only 5 pound weights? Whatta WIMP! Yes, that's Ryker, helping snoopervise a workout session. Mommy wants you to know she's now up to 10 pound weights for chest flies - HA! MOL! We know you could lift them with just one paw! Well, it IS more challenging with a cat on your chest! Way to go mum.....we know all your achievements are down to Rykers' expert supaw-vision. Have a super Sunday. That is better than MY human - she can do them with 8, although she usually wimps out and does fives (she blames her shoulder - hello! That rotator cuff injury was from two years ago). I don't help with the weight workouts - only with yoga. And sometimes I help with her cardio dance workouts by walking around her to help her with her agility. We have never seen TBT exercise, so we cant snoopervize. Ryker seems to be doing a great job though! Ryker, you are doing a good job because she has perfect form! 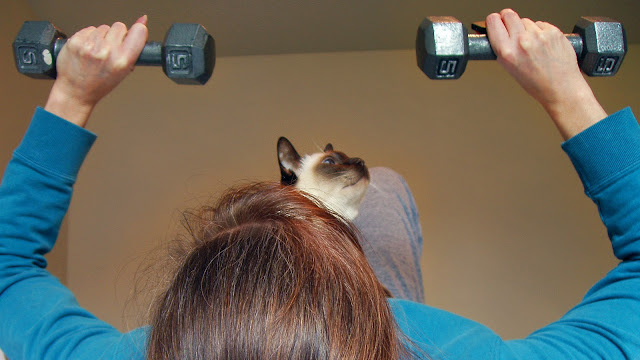 Ryker was a pawsome personal trainer!!! Oh jeez. Mommy is reciting: we must, we must, we MUST INCREASE OUR BUST! Excellent job snoopervising! Mom Paula is LOL at the Katnip Lounge comment. "Your hand position is a little sloppy," he says. We help our mom with her yoga, and we even demonstrate the positions for her--Kelly said she'd always needed help with that, but she still doesn't do them right. Humans! Well, we're impressed...even with the 5 pound weights!! LOL.. glad to know my cats aren't the only one watching my form.